A beautifully restored four bedroom stone built period property located on the outskirts of Meltham, a small town in West Yorkshire. In the foothills of the Pennines a few miles from Huddersfield, Meltham is within close reach of Manchester, Leeds, Wakefield and Sheffield. 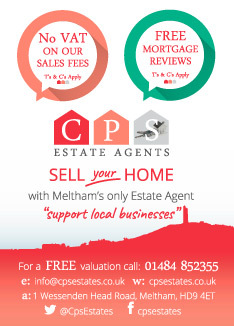 Meltham boosts great local schools and amenities including Supermarkets, local shops, bars, pubs and restaurants. Once the local mill owners house this mid terrace property has been extended and modernised throughout by the current owners who have tastefully combined period features whilst providing spacious modern family living. The property comprises of an entrance lobby opening into a light and spacious lounge with a large window to the front of the property. This delightful room is full of character and charm and benefits from a multi fuel stove, exposed beams and a solid wood floor which continues throughout the whole of the downstairs. There is useful storage available under the stairs. Reclaimed wooden doors have been used throughout the house, with one leading from the lounge to a generous sized dining kitchen. The room has been tastefully modernised with a mix of dark grey painted base units with wooden work surfaces and open shelving but maintains the period features with exposed beams and a Belfast sink. In addition there is a large electric range style cooker with extractor and plumbing for a dishwasher. More storage is provided under the bench seating and within another large built in cupboard. A single storey extension has been added to the rear of the property which houses a good sized utility room with fitted base and wall units, contemporary tiles, sink and plumbing for a washing machine and dryer. There is also a downstairs cloakroom/WC and a door to the back garden. The open plan staircase leads from the lounge to the first floor where 3 well presented bedrooms and family bathroom can be found. There is a large double bedroom to the rear together with two good sized single bedrooms to the front of the property. The family bathroom has been modernised to a high standard in neutral tones and has a white 3 piece suite with a shower over the bath. From the landing a separate staircase leads to the luxury master suite. Stretching the full width of the house, light floods into this impressive space through mullion windows and sky lights. The open plan layout provides 3 separate spaces for a snug/sitting area, a large bedroom area and a recently added modern ensuite shower room. The high vaulted ceiling adds to the feeling of space and exposed original brick work and beams maintain the character of this beautiful room. Outside the property has a small front garden with allocated off road parking for 2 cars. To the rear is a terraced garden made up of decking, borders and a lawned area.